Today on PokéMonday, Let’s take a look a the Kalos Region Legendary Tins! With Summer Time, comes the Summer Tins. For those who aren’t familiar with Pokémon TCG Tins. They’re Seasonal Collections usually following a theme, and this year’s Summer Tins feature the Legendaries from the Kalos Region, Shiny Xerneas, Shiny Yveltal & Complete Forme Zygarde. Now let’s take a closer look at the contents. The first thing you’ll get is the Exclusive Promo EX Pokémon, shown on the front of the Tin. These Promos are re-prints of existing cards from the current Standard Format. However they each do feature a unique variant artwork. 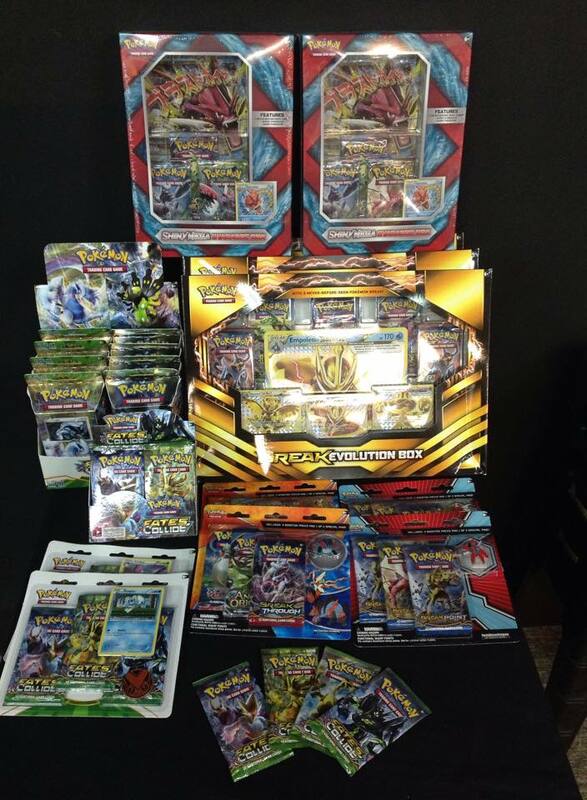 Within the Tins, you will also get 4 Booster Packs, 2 from the Current “Fates Collide” Set, as well as 1 pack from “BREAKThrough”, which debuted the current BREAK Evolution Mechanic, and 1 pack from “Roaring Skies” which is one of the highly sought after sets from the current Standard Format. The Pokémon TCG: Shiny Kalos Tins also contain code cards that can be redeemed in Pokémon Trading Card Game Online. These code cards will unlock a digital version of the corresponding promo and also unlock a full deck and matching deck box featuring Xerneas, Yveltal, or Zygarde for your online collection! So come down today! These Tins are available in store right now! PokéMonday: Pokémon TCG on the GO! Today on PokéMonday, we’ll be talking about Pokémon Trading Card Online. With Pokémon Trading Card Game Online, you can play Pokémon TCG even on the go! If you remembered, every Theme Deck, Booster Pack and Pokémon TCG Collection comes with a Code Card that unlocks a digital version of the product you’ve just got. Now let’s take a look at what you can do in Pokémon Trading Card Game Online. Every time you login, you can complete Daily Challenges to earn booster packs, Trainer Tokens, and more! Trainer Tokens earned at Pokemon.com or in the Pokémon TCG Online, can be redeemed in the Shop for booster packs, theme decks, and cool gameplay accessories! You can earn free booster packs by defeating computer-controlled opponents in the Trainer Challenge! Redeem code cards found in yourPokémon TCG products to unlock online booster packs, theme decks, or promo cards! If you need to get that one specific card, you can use the in-game Trade system to expand your online collection! By searching through the public trade offers, you can get cards that will add the finishing touches to your favorite deck! A wide selection of options allows you to play at your own pace! Brush up on your skills while battling against computer-controlled opponents in the Trainer Challenge! Test your skills against your friends or challenge random players from around the world in Versus Mode! As you win games through the Versus mode, you’ll climb up the Reward Ladder to earn cool rewards! Use your favorite Pokémon TCG theme deck, or build a custom deck using the Unlimited or Standard deck construction formats! Today’s Pull of the Week comes from the Fates Collide Set. However this Card is not a Physical one, but one from Pokémon Trading Card Game Online. So this week’s card is MEGA Alakazam EX. A full art version to boot. So here’s the fancy Digital Card. At a glance, it is very easy to overlook the use of this card, due to the fact that the printed damage is only 10 Damage. However, if you read the special effect, it does 30 more Damage for each damage counter on the Defending Pokémon. That means if the opponent’s Pokémon has 30 Damage (3 Damage Counter) on it, Zen Force will deal a total of 100 Damage! Put together with Alakazam EX Ability (Kinesis) which allows you to place 2 Damage Counters on the Opponent’s Active Pokémon as well as 3 Damage Counters on 1 of your opponent’s Benched Pokémon when it Evolves into MEGA Alakazam. That make it a really interesting way to deal damage to your Opponent’s Pokémons. Reality Shifts—and Is Remade! Mega Alakazam-EX sees the future—and shapes it to unify two worlds! The Legendary Pokémon Zygarde arrives in many different Formes to bring order, together with Lugia BREAK, Mega Altaria-EX, and Umbreon-EX. Fates are sealed, and two Pokémon worlds join together in the Pokémon TCG: XY—Fates Collide expansion! With it being the 20th Anniversary for Pokémon this year. Games@PI is now stocking Pokémon Trading Card Game. With Theme Decks and Booster Collections from the newly released XY Fates Collide set.